The soft-shooting CCP…now with tool-less takedown. Thanks to the innovative SoftCoilTM recoil system, the original CCP earned a reputation as one of the softest-shooting concealed carry pistols on the market. The SoftCoil gas-delayed blowback system uses gas pressure from the ignited cartridge by directing it through a small port in front of the chamber to slow down and delay the rearward motion of the slide. Unlike the gas system in an AR-15—where the gas is channeled BACK towards the action—the SoftCoil system actually channels gas FORWARD, which retards the rearward motion of the slide until gas pressure has decreased. But there's more to the CCP M2 than its innovative operation and easy takedown. Because the CCP M2 has both a manual safety and a firing pin block safety, the trigger can be nice and light at right around 5.5 pounds—another huge advantage over other carry pistols. The grip is nicely textured for firm grasp, and the highly-undercut trigger guard allows for a high hold and better recoil control. Classic Walther innovation, classic Walther trigger, classic Walther value. What's better than that? 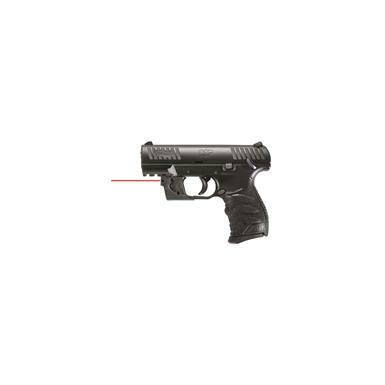 This model includes a triggerguard-mounted Viridian® Red Laser for fast targeting.